As Bhagat Singh was to the Angrez. To what is with mortal dangers fraught. Sanjeev sahab is a good example of good citizenry. Aweosme words for 0fficer Bhatt! Thanks Prof Raina!! May I request people of the worldto unite, come forward to be the support of this man! Officer Bhatt indeed is “Courage” personified. Our salute to this brave heart!! Can we do something for this man, who has risked his all for people like us, so that we sleep safe?? This noble soul is fighting his battle alone,let’s come tother to be with him at the least!! Modi ka Gujrat nirala huwa badnami sey behad kala. miltey usmey chor uchakey, daku bhi aur khooni bhi. Modi jab bhi ata hai manch par, lakhon uspey thooktey har dam. Modi jab bhi upwaas karta , kharchey jum kar hotey hain har dam. Modi jab sota hai thak key, jail key sapney dikhtey hain har dam. Modi adhi raat ko uthkar, rota hai apney kiye par raat bhar. kabhi kabhi jab need ati hai, bistar par hagleta hai dar kar. ek taraf SC ka dar hai, doosri taraf hai dar Bhatt IPS ka. jasoda ney bhi thooka hai uspar, to thooktey hain sabhi log uspar. oonchey oochey imarat banaya, Reliance ko bhi shamil kiya. that hi Gujrat pehley sey oocha, kiya kya Modi naya karnama. bas mara uney mazloom musalmaan, isai ko ka bhi girija giraya. RSS bhi jayegi gadey mein, wo din hai ab aya sameat key. Meri tumse guzarish hay aisi kavitae likhte raho- inse desh wasi sajag honge aur sampradic sauhard badhega. 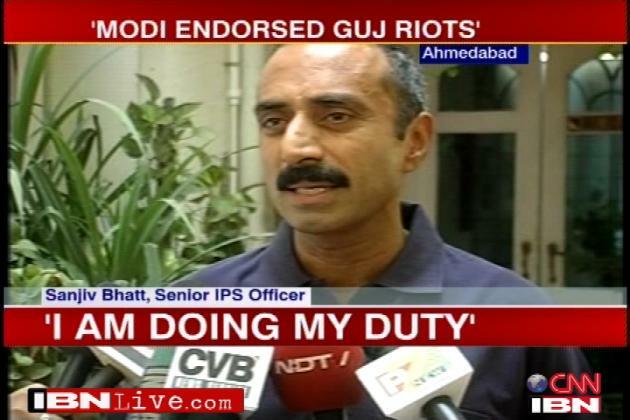 Sanjeev Bhatt ! You are Great ! Though many of us thinking of out inner feeling many times, which hurt some of us many times, we never come out like WHAT YOU DID, since we are sick of these dirty politicians and the love and affection we have with our families. You have considered the affected families as equal to as your own. Great. There are no words to praise you. Atleast I know one of the high level officer who told me once, I have resigned since I could not tolerate what these dirty politician asking me to do. He is not at the Junior level person. He is THE SENIOR MOST in the state hierarchy. Having said that People in particular Modi does not have any back bone now to do anything wrong. If he has not learn his lesson yet, then for sure I hope, WE, THE PEOPLE OF INDIA , will TEACH HIM THE RIGHT LESSON. My heartiest sincere wishes to you and your loved ones who has ready for any kind of sacrifices. You r real hero of our country. You r real one man army. Modi u r big cheater in gujarat. Jab chadi ghili ho jati he modi ki tab a.c hall me upvas krte he. Pr, ab bhot samay tk tumhara dhong chalne vala nhi he, kyun ki gujarat me honest ips aa chuka he, ab aapki lilao ka ghada futne vala he.